My Point Of View about EVERYTHING! 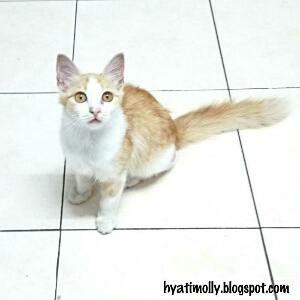 Last week hubby brought back a female stray cat that he found nearby Prima LRT station. The kids (especially my daugther) are so excited and pratically begging me to let the cat stay with us. Honestly I feel uneasy because I vowed never to take in any pet since I lost my pet cat many years ago. However I gave in to hubby and my kids pledge that they will take responsibilty on its health and hygiene aspect. So from now on my small family number is 7. Million Thanks for Leaving me a comment! Story Of My Father, My Idol.. Happy Harvest Festival 2011 ! COPYRIGHT @ 2016 TUNUNG'S LIFE . Powered by Blogger.